Our six-year-old has been asking to go fishing since last summer, and this weekend we finally got around to it. As it turns out, Rhode Island has several waters stocked with trout exclusively for children ages 14 and under. However, for this trip, we headed out to Slater Memorial Park in Pawtucket. The trip began with a stop at Benny’s — Rhode Island’s answer to Wal-Mart, Benny’s is a small store that often has exactly what you’re looking for (fishing poles, kid’s bikes, school supplies, large storage bins, automotive supplies, gardening equipment and seeds, etc.) There, Geoff bought two fishing poles and some fake bait. The next stop was the R.I. Aquarium and Pet Center for some lively worms. The reaction shot after catching the fish. We then staked out our spot along the pond at Slater Memorial Park. The first few hours involved our repeatedly twisting the fishing line, twice catching our hook in some tree branches, and reeling in our line repeatedly to discover the fish had once again taken the bait and escaped unhooked. Our two-year-old seemed to think we were simply feeding the fish and exclaimed excitedly each time the hook came back from the pond emptied. Perhaps that’s what made it so surprising when we got pull on her rod and reeled in an actual bass. 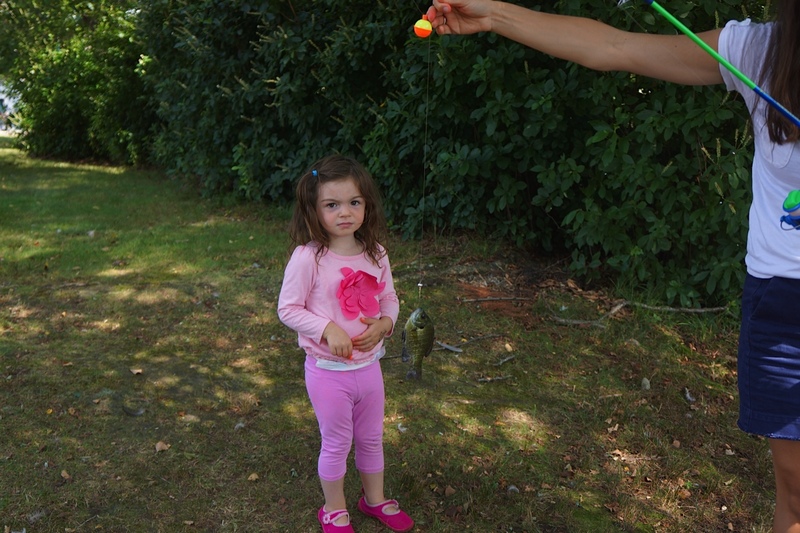 You can see by the photo how enthusiastically she posed with her fish. Even without such success, it would have been a great day at the park — we also took a swan boat ride (a bit pricey at $5/person), several carousel rides (only 25 cents each), and found a large playground. The park also contains a children’s zoo at Daggett Farm, a gallery within the Rhode Island Watercolor Society, and a seafood restaurant, not to mention tennis courts, baseball fields and a bike trail. Apparently, we’ll need more than a day to complete our exploration.